Easy-to-access reversible bits #1 & #2 Phillips tip, and 1/4" & 3/16" Flat tip. Built-in nut drivers 5/16" & 1/4" deep-reach. Ball/Spring retension shaft positive lock-in with handle. So fat it doesn't fit into any of the loops in my tool roll. Will probably sand it down to a more manageable size. Great package for the price. I have about 5 of these scattered throughout the barn, garage, and house. Very convenient for the money. I've added this to my riding pack. It has replaced multiple tools and saved me space and weight. A must have for the ol Toolbag! 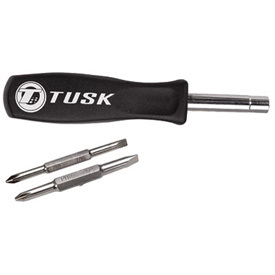 get one today Tusk Quality!! Best multi driver I've used. This is my favorite screwdriver to have on hand. The most versatile and well made multi driver I have used. I keep one in each vehicle, one in my riding pack and one in the house. I can remove, clean and rebuild most off road motorcycle carbs almost entirely with this one tool. He best investment I ever made! Great tool! Works for my bike and things around the house! Great for the trail kit. A great addition to the already crowed tool box on the RZR. The handle is a little fat, taking up extra room in my pack. Otherwise it's a great product. A must have for the trail, and the price is great. Just your average multi-tip screw driver but at reasonable cost. 6 in 1 Works great. Awesome tool for the space. Nice addition to the tool bag! Very handy and takes the place of six tools! Everything I expected, a great value. It funtions but is probably better for someone with smaller hands. I can't seem to get a good grip on the handle, but I have big hands. Must have for every toolbox! This is a great little multi purpose tool. Convenient, and lightweight! A MUST HAVE for every toolbox!